When choosing colors to use for your home, you usually think of using your favorite and draw around inspiration from that particular color. Now, that is not a bad thing. Most often than not, we can get color scheme inspiration with our fab color palettes and tips for choosing the right colors for your rooms, from calming combos of neutrals to color-studded palettes in green, blue, red, yellow, and more, see how hues work together to both unify rooms and create eye-catching contrast. Learn how to match colors and use fabrics, accessories, artwork, and more as inspiration for crafting a color scheme that fits your home and your style. With expert advice and photos of rooms with gorgeous color schemes, you’ll be equipped to start crafting your own color schemes to apply to the rooms throughout your home. 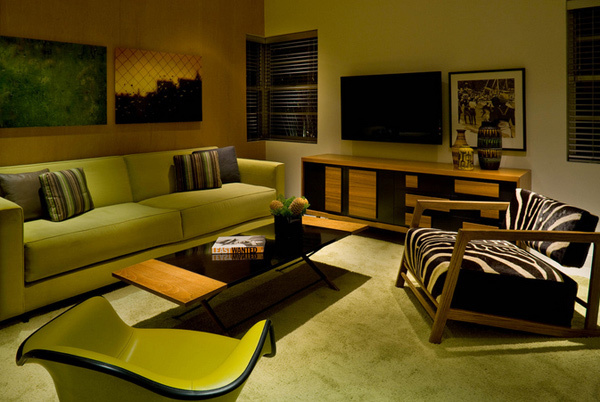 Now, let us check out the 15 Trendy Living Room Colors You Can Choose From, and tell us what you think! Using a cream-colored wall treatment for this space made the color really pop out. 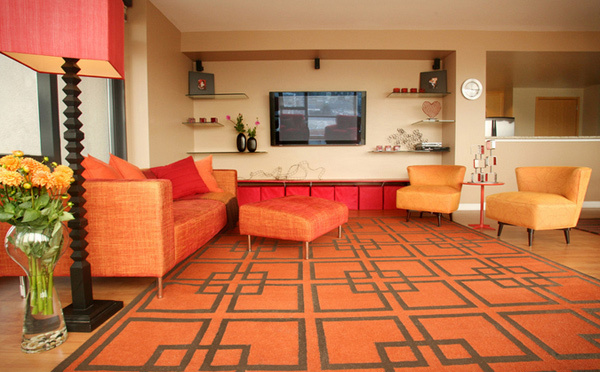 The area rug is from Jonathan Adler and tells us you do not like the sofa? The use of accessories provide the color in rooms with neutral walls. 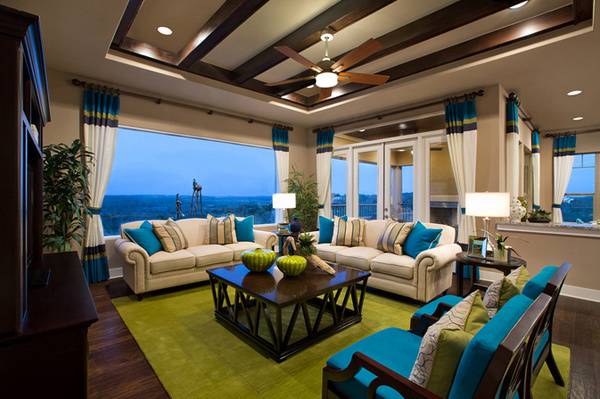 Here the blue and green come in through the cushions, throw pillows, rug and pots. Grouping accessories in threes keeps tabletops interesting yet clutter free. Phillip Moose did a great job in that fab painting on the wall. 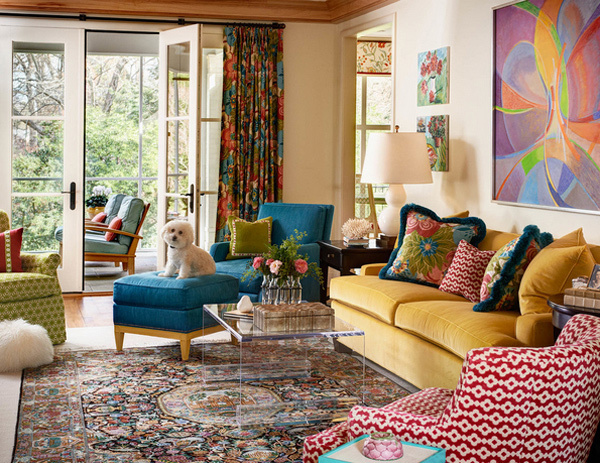 The colors in this living room sure are popping out here and there. 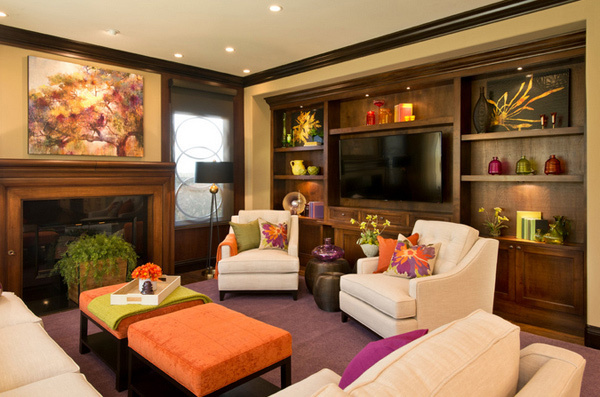 Notice the Carter Kustera Portraits on the wall that kick start the colors in this living space. 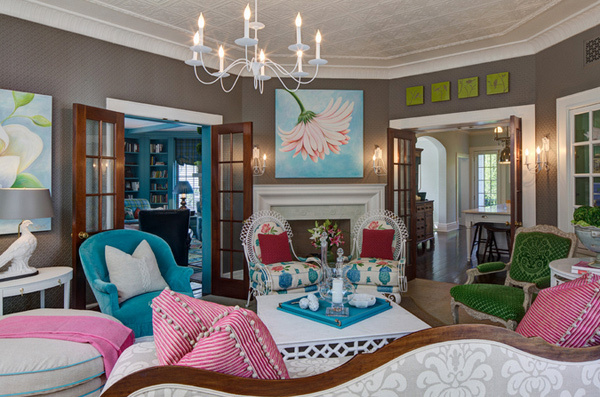 Printed pillow cases and colored area rugs like this makes one room truly fantastic. 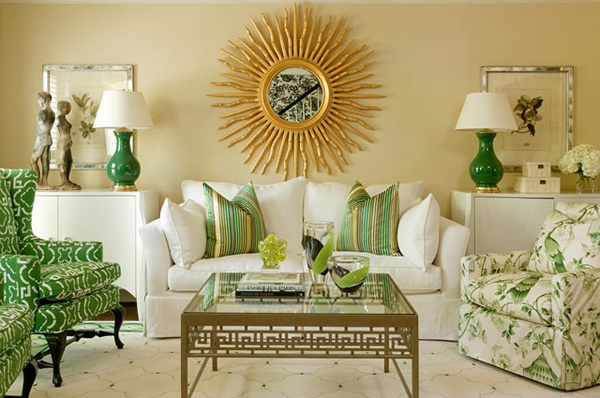 Green in a whole lot of different varieties is what made this room really pretty. The whites, gold and brass accent this living room. Go wild with color. Vacation homes are where you can let loose, so why not let your creative juices run wild? Yellow is a strong, warm color, with pleasant and optimistic emotional content. 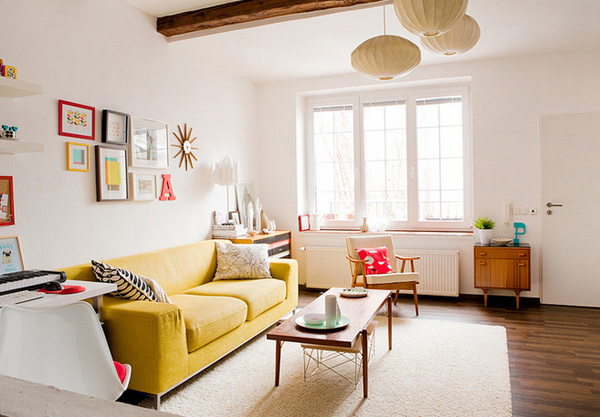 Yellow is the least problematic color, a cheerful and non-aggressive hue. This jovial color is highly-reflective, producing expansive characteristics reminiscent of sunlight. A masculine-themed living room makes this New York space really mature and surely funky. The browns and whites that accentuate the space made it seem that this room is actually for everyone. Don’t you just love the combinations of blue and green, specifically watery blues and bright, shocking greens? They just play off each other so well. And even though they are cool colors, they feel pleasant and inviting together – perhaps because we associate them with nature, the sea and the sky. Every little thing in this living room complements one another. The emerald theme was evidently achieved by the designers, the Granta chair, Spore chalk white mirror, the Pablo table and Arabesque rug in emerald made it all worth it. The play of vibrant colors in this living room is fantastic – using oranges and greens, even lilacs complemented well with the whites, browns and blacks evident in this stunning San Diego home. There are two major tones that are played in this living room and they surely match well. Apple green and black may be the favorite of the homeowner of this picture. A rich shade of violet paired with grey is stylish for a contemporary space like this, it made this room much more eye-catchy and classy. We hope that we assisted you in picking the right inspiration of colors for your space, and next time when you hear some friends expressing reluctance in painting their homes in vivid hues, you can always tell them to be brave and try color combination which works just fine. The 15 Trendy Living Room Colors You Can Choose From is definitely a good list you can always check back later on. 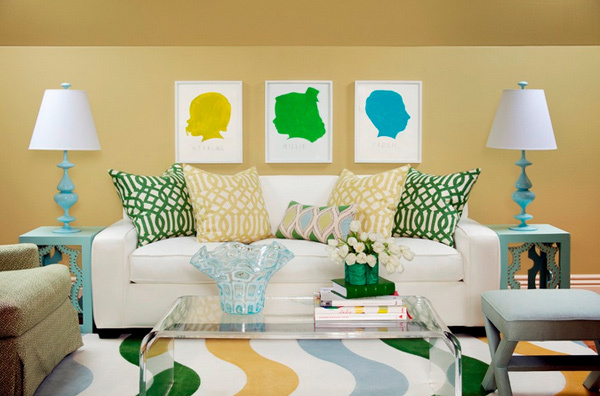 Also, do check the 15 Interesting Living Room Paint Ideas and we hope you’ll have a great week!